When the Devil Drives… plenty to enjoy in the passenger seat! 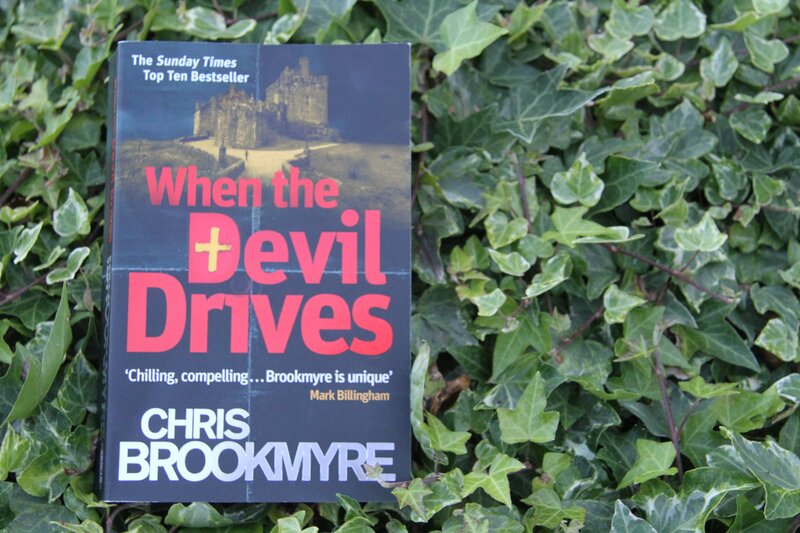 There are many things about this novel, the first of Chris Brookmyre’s that I’ve read, that I admire. The novel is set in Scotland and the author successfully conveys that country’s rawness and beauty without descending into shortbread and Bannockburn lyricism. The plot is brilliantly crafted, with believable twists and turns until the very last sentence; it explores the dynamics of relationships on several different levels; and one of the protagonists, a private investigator named Jasmine Sharp, who inherits her uncle’s private investigation agency, Sharp Investigations, is only twenty-one years old, which makes her unique amongst the fiction detectives of my experience. She’s also an actress manqué, which helps her considerably in her adoption of a career that she has literally fallen into by accident. In When the devil drives, Jasmine’s pursuit of a long-disappeared missing person collides with the investigation of a present-day crime being conducted by Catherine Macleod, a senior police officer. Parallels and contrasts are drawn between the two women in both their professional and personal lives. Catherine has a similarly edgy but not hopelessly antagonistic relationship with her husband. More bohemian than she, he clearly thinks that she is over-protective towards their two sons – a natural result, we are encouraged to conclude, from what she sees and suffers daily as a policewoman. I have to confess that I find the portrayal of Catherine the weakest facet of this novel. Her assured public role – she is almost brutally terse in her treatment of colleagues – sits ill with the neurotic wife and mother that she becomes at home. However, the main problem with Catherine is that her character fails to engage the reader to the same degree that Jasmine’s does. Many crime writers develop two characters to act as foils to each other: Stephen Booth’s Fry and Cooper and Anya Lipski’s Kiszka and Kershaw spring immediately to mind – but their success lies in making each character as appealing as the other, despite their very obvious differences. By contrast, in When the devil drives, I found myself impatient to get back to Jasmine during the Catherine scenes. This is a realtively minor blemish, however. I won’t say too much about the intricate plot of this novel, as I don’t want to spoil it – and I should like to encourage anyone who is reading this to get hold of a copy of the book. Brookmyre has an original style and I’m sure will write many more such successful and entertaining novels. Another to add to the list! This sounds intriguing from the relationship perspective! I love Chris Brookmyre’s work and recommend starting from his first novel, Quite Ugly One Morning, then reading everything he’s had published. Great stories and dark, dark humour. I defy anyone not to laugh at QUOM’s opening chapters.